4/12/09 We made our return trip to the Rainy River on Saturday. The weather was great, but the fishing was pretty tough. Speed of the river current had increased a bit since our visit on Thursday, but it wasn't out of control yet. When I watched the GPS as we drifted, it showed a speed of about 1.7 to 1.8 MPH. The water temperature still hovered around 36 degrees all day long and we noticed steady increases in the runoff from small incoming streams. The areas that we fished on Thursday didn't have many fish left, but we did find a few there. After a lot of looking around, we finally found a small school of Walleye that were located on a current break close to the shoreline. The structure was the classic "eddy" formed by a rock point and where the slack water meets the current, we were able to hold with the MinnKota and cast 1/4 ounce jigs into the slower water. As we worked the jigs back toward the boat, the fish would hit just as the bait moved into the current edge. From what we saw, folks that were fishing this type of structure had about the best deal going. Some were anchored and some were slipping backward against the current like we did. If you're heading up there for the last couple of days, I'd suggest looking for as many of these slack water spots as you can find. For us, fishing up stream from Birchdale was the area that presented the most opportunities. For what its worth, the water is high enough now that several boats had gone up past the rapids and there were several of these slack water spots created by the rocks and shorline points. 4/10/09 The weather finally gave us a little break and we fired up the truck and made the run up to Baudette to fish the Rainy River. The air temperature on Thursday peaked somewhere in the mid to high 30 degree range and the surface temperature on the river stopped climbing at 36.3 degrees. The water was much less muddy than we had expected. The current was a little faster than I like it, but it was completely manageble. Most of the rivers that flow in to the Rainy were still frozen solid, so it's going to take a couple of days for conditions to change dramatically. Traffic at the landings was moderately high, but we didn't have too much trouble getting in or out. From what we saw, it might have been best to run up to Birchdale because the traffic seemed a little light in that area. We fished steady all day long on Thursday. The morning was a struggle, after noon we started picking up a few fish and later in the day as the temperature warmed up, the action got steadier. That said, for this great Walleye river, it was one of the least action packed fishing trips we've had in recent years. By the end of the day we were probably getting close to 20 Walleye, but I'm sure we didn't get over that number. We usually get some larger fish, but on this trip 22 inches was our best. The average size was really nice though and we did get a limit of fish between 15 and 18 inches. Our best work was done by holding tight to the breaklines adjacent to the deeper holes. Best depth was 15 to 17 feet and we were able to fish with 1/4 ounce jigs. We had Rainbows and Fatheads and it seemed like they worked equally well. We didn't experiment a lot with colors, but the yellow/orange , orange/black, and yellow/pink combinations all caught us some fish. Bill and Matt used Fireballs and I wound up liking a 1/4 ounce Jedi Jig with a red hook. We're planning a return trip on Saturday so we'll see if the warmer temperatures perk up the action and I'll try to post that Sunday morning. 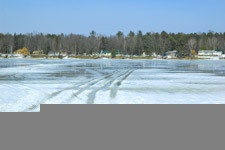 4/7/09 When its almost Easter and you're still driving on the ice, you've gotta wonder when winter is going to finally give in and let us get the boat out. 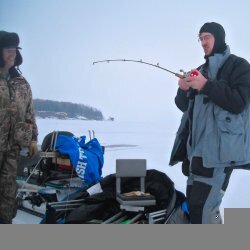 We were hoping to fish the Rainy River for Walleye this weekend, but instead we wound up ice fishing on Rainy Lake. I have to admit that it was a beautiful day, but the fish didn't cooperate at all. We targeted the Northern Pike that were reported to be on the move, but after talking to lots of folks on the ice, it sounds like we missed the big move by about a week. The obvious move would have been to get into the shallow water near the river, but the ice is all but gone in areas with moving water. So it was either fish deep where the ice was still good or not fish at all. On our way home, we checked the ramp at Pelland where we found the river wide open, but the ramp still covered in ice. The Rainy River looks great in that area. There is a steady current and the water is on the high side, but it was fairly clear and far from being at flood stage. We are optimistic that we'll get out there this week. Any sign of a warm day and we'll be on our way. 3/30/09 After some technical glitches and delay of game penalties, we finally made it out onto the lake for the evening Crappie bite on Sunday. I can't believe how much the ice conditions were improved since the recent cold snap. All of the water and slush on the ice was gone and except for some slush at the landing, travel conditions were really great. There's still at leat 20 inches of good ice so if we don't get a major warm up, you could probably still make it out again next weekend. The Crappie Fishing turned out to be fairly good, especially for Chester powell who had the magic bait, or the magic twitch or something. I'm sure he caught at least half of all the fish single handedly. He was using a small Northland Forage Minnow and no matter what the rest of us tried, the best we could do was to trick a few fish here and there. The fish were still kind of deep (23-25 feet) for this late in the winter, but they were closer to the shoreline. It wouldn't be a bad idea to check some of the early fall type of spots where you find deep water close to shore. We didn't bring any minnows, because there are some Blugills mixed in and sticking with the Eurolarvae and Wax Worms seemed to be a good idea. If I head back out on the ice this week, I'll drag out some minnows too. River Fishing Walleye is still the top thing on my mind, but we'll have to wait and see if nature is going to give us break. The colder weather definately slowed down the runoff and if it stays this way, the river might get a chance to settle down. if that happens, I'll let you know. 3/29/09 Winter refuses to give in this year and I guess we're going to go with the flow. 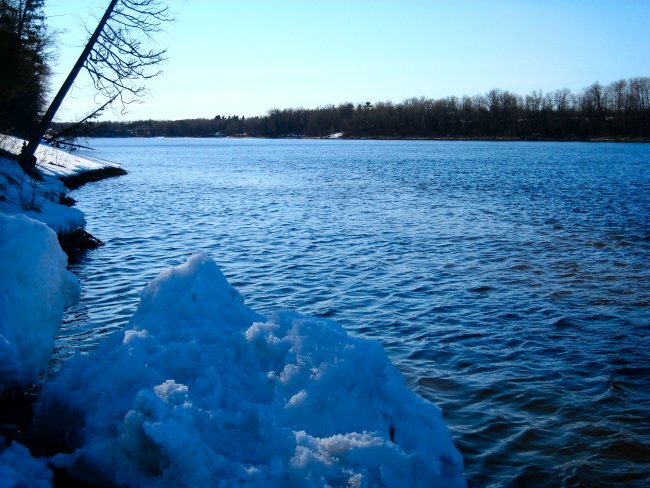 Our game plan for Sunday was supposed to be a trip up to the Rainy River, but it sounds like the water and ice is moving a little too fast for our liking. Instead, We're going to take advantage of the ice firming back up and make another trip for Crappie and Bluegill. While I did my taxes on Saturday, my buddies were up to the lake and caught most of a limit of Crappies along with a half limit of Bluegills. Naturally, they called me from the lake to rub it in, so today I woke up nice and early to get a head start on paperwork, then I'll be breaking out the ice gear one more time. I'm kind of disappointed about the river, but we might not be out of business yet. Thanks to this cold snap, the melting slowed down and it's giving the water a little time to stabilize. We're keeping an eye on the conditions and the boat is ready to go. 3/25/09 Well the weather hasn't exactly inspired me this week, but as crummy as it's been, we're on the fast track for some good river walleye fishing within the next few days. There are some boats already using the Birchdale Ramp on the Rainy River and the rain is working on busting open a lot of the tributaries. The only risk now is getting too much rain or warm weather. In Deer River, we're now getting snow showers instead of rain and the air temp is supposed to drop into the teens tonight. That should slow down the process just a bit and hopefull give us a week or so before the mud and flood water wrecks the Walleye bite. Closer to home, some of my pals are still ice fishing and doing well. Most of the resorts on Winnie have shut down their ramps, so if you're thinking about it, four wheelers are now required. Just before they closed for the season, The Pines Resort was reporting good Perch action in Tamarack Bay on Lake Winnie. Cutfoot Sioux has been fished pretty hard, but there are still some Crappies hitting up there and lots of Tulibees have been coming in too. We're coming into the busy season now and I can hardly wait for open water! Start watching for pictures that show open water and you'll see a smile on my face even if I never catch a fish! For folks who want to stay in touch, I've been trying to take advantage of my Facebook page and I have a fishing group started so join up if you feel like staying in touch. 3/18/09 For me, the next week is all about talking fishing and not about doing fishing. I just wrapped up a major overhaul on a website for one of our favorite Northern Minnesota Resorts and now I'm polishing up a couple of fishing seminars for the upcoming Grand Rapids Sport Show this weekend. I've been talking with some of my fishing pals and there are some good fishing spots around the Deer River area right now. 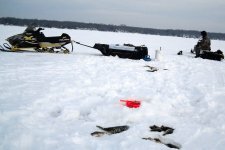 Leech Lake has been producing some good catches of Perch this week and many of the smaller lakes are producing Crappies and Bluegills. I'm heading out for a quick tour of the lakes to see what we have for ice condition and I should have some news this (Wednesday) evening. 2/28/09 I'm finally getting back in the game after a disappointing close to the Walleye and Pike season last weekend. I had to bail out of a few fishing trips when I came down with some kind of bug that kept me on my back for several days. Now that I feel like I've got my legs back under me, it sounds like my game plan is going to be either Tulibee or Trout fishing this week. Travel conditions on the ice shouldn't be too bad this week. We got some snow from the last storm, but we didn't get hit bad, maybe two or three inches. I did some calling around the past couple of days and the Perch action is reported to be getting better on Lake Winnie and it's said to be good on Leech lake right now too. 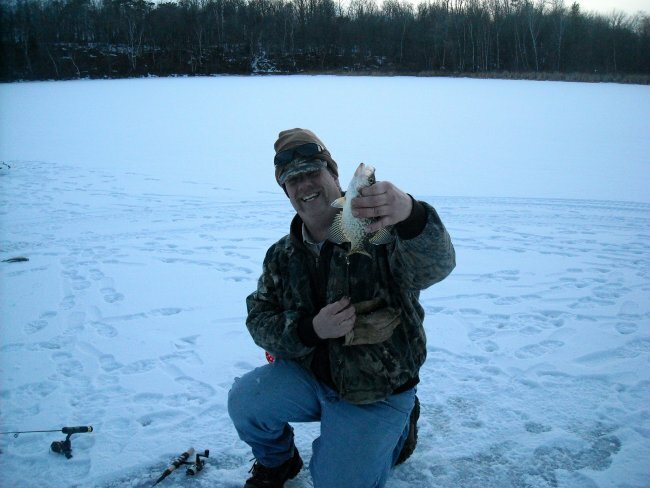 Crappies are spotty, but they are hitting, especially ofn some of the really small lakes that never got fished earlier because of the deep snow. Everyone I talk to has been catching Tulibees as they fish for Crappies or Perch. We've already smoked a couple of batches and I think I'm going to try and catch another batch for the smoker next week. 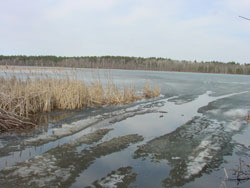 2/13/09 On my way down Highway 38 from Marcell, MN on Thursday, every lake I saw was in the same condition. The snow on all of them has melted down to the ice surface and except for being slippery to walk on, it looks like we'll have a lot easier time walking around during the next couple of weeks. I'll know more about the larger lakes later today (Friday), but email me if you have questions about a specific lake and I'll see what I can find out. 2/11/09 The big meltdown we've been waiting for is here. Things are kind of sloppy right now because we've had two solid days of rain. The good news is that when we get our next cold snap, it's going to be a lot easier to move around. For the next couple of days, we're going to have be really carefull about where we go until the slush settles. But after that we'll be in pretty good shape for a while. No fishing for me in the next day or so, but I'm going to head out to see what the ice looks like and I'll update that report in the morning. 2-7-09 We managed to make it out on Friday and it looks like the weather is beginning to work with us a little. We made it up to Bowstring which is typically a good Walleye lake this time of year and we did have a little action up there. The snow cover on the ice is starting to pack down and even though snowmobiles are still the only good way to travel, it's getting easier to walk on the snow so at least you can move around to drill holes and search for fish. I was disappointed to see that in certain spots, there's is still a lot of slush, so we're going to need some more warm weather and then another hard re-freeze before conditions will be good for folks who want to drive. On Bowstring, there is one plowed road coming out of Bowstring Shores Resort that provides some access to the North side of the lake and we did see a few vehicles traveling out on that road. The fishing was fairly steady, especially considering we fished mid-day from around 11:00 AM to 4:30 PM. We caught six Walleyes and a couple dozen Perch and a bonus Tulibee all in the same area on a sunken island at about 15 feet deep. We didn't experiment a lot with baits because the 1/8 ounce jigging spoons we started with kept on working all afternoon. I used a green and orange and Bill used gold, both tipped with minnow heads. Traffic on the lake was light and we didn't talk to many anglers out there. It may be a good time to take advantage of the low angling pressure. 2/6/09 Walleye fishing is on the agenda for today (Friday) so there will be a fresh report either tonight or early Saturday morning. We're going to take advantage of the great weather while we have a chance and we're really hoping that we get enough of a meltdown to get the slush and snow mixed in time for a re-freeze. Please check back in the morning for an update. 2/1/09 Finally a break in the weather, on a weekend! It may have been short lived, but we took advantage of our opportunity on Saturday and made a quick day trip over to Bayfield and spent a wonderful day on Lake Superior. We had heard some great reports about the Lake Trout action over there and this was my first chance to see it first hand. Obviously there were a lot of folks who heard the same reports we did, because there were a couple of hundred anglers spread around the bays to the Northeast from Bayfield. The action wasn't quite what we'd hoped for, but there were fish caught. Some fish were better than others, but overall it was a nice representation of what the lake has to offer. What the fishing didn't do for our spirits, the weather made up for in spades. This was by far the nicest day we've had all winter long. I couldn't believe my eyes when we got back to the truck at sunset and saw that the air temps were in the mid 40's. Another nice surprise for us along the way was our stop at the "Outdoor Allure" Bait Shop in Washburn, Wisconsin. When you're in the tourism industry, you tend to notice the attitudes of people you meet in your travels. Stopping at this small, unassuming shop was really a treat. Not only did they have everything we needed for our trip, these guys were welcoming and helpful in every way. I'm not sure if we'll make it back to Bayfield this winter or not, but if you've been interested in trying your luck at ice fishing for Lake Trout, this might be a trip to take a look at. email me if you're interested and I'll help get you some more information. 1/29/09 We are supposed to have a nice warm up this weekend which should help some folks get out on the ice. My fishing buddy Matt Mattson has lined up a Lake Trout trip over on the Wisconsin side of Lake Superior, so we're going to head over there and see if we can make up for lost time. It's bee quite a while since there was enough ice over there to make the trip worth while, but it sounds like we'll have enough to make it this year. Locally, travel conditions are still tough on most of the lakes, but there have been enough anglers moving onto a few of the lakes to make "cow paths" that will help get you to some decent fishing. There's a little Crappie action in the 25 to 30 foot range on Cutfoot Sioux and in about 15 feet on Little Cutfoot. 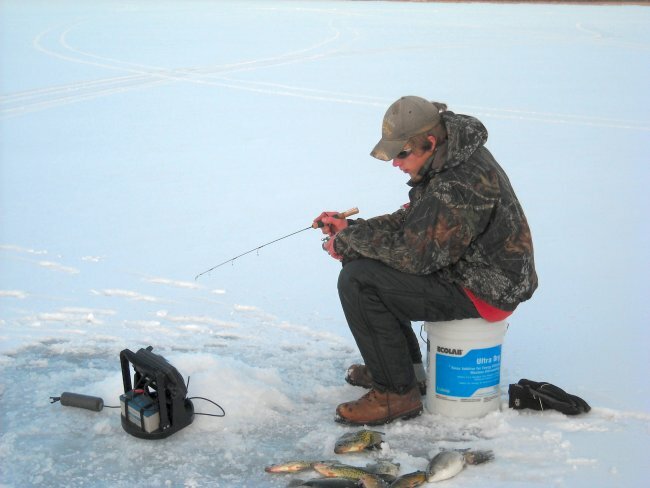 According to reports, the Bluegills are hitting out there too. It's been at least three weeks since we had any big snowfall, so all of the roads plowed out on Winnie are in good shape. The Perch action out there has been hit and miss so far, but there are some groups that have done really well. With better conditions this weekend, your odds are better than they've been for a while. I'm going to head up there (Winnie) today and I'll try to jot down a few notes if I find anything interesting. 1/17/09 The weather finally broke on Saturday and a lot of people who have been cooped up during the recent deep freeze came outside to get some fresh air. 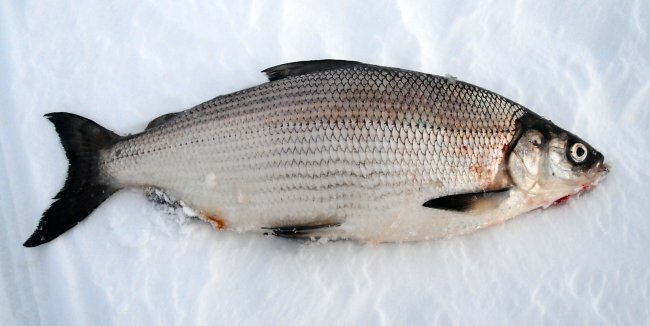 Even though the temps are warmer, there's still a noticeable lack of "buzz" about fishing, mainly because it's tough to get around on the ice. 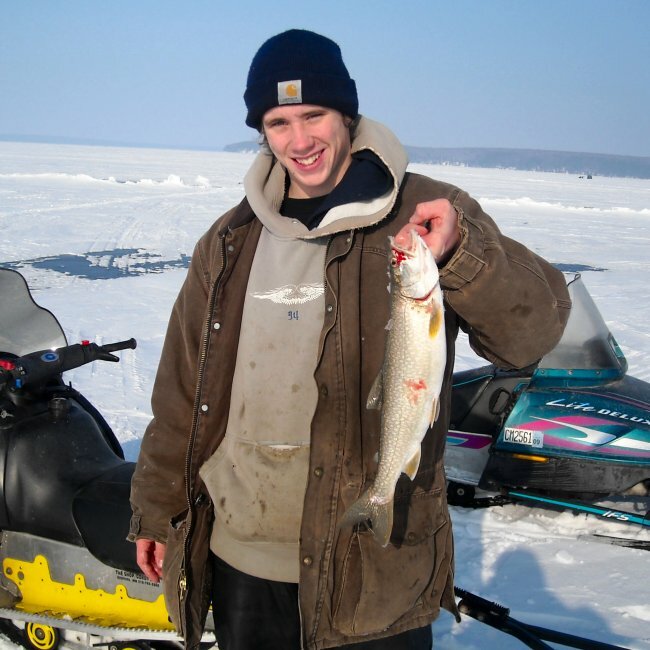 Bad news for fisherman, great news for snowmobilers! It's been years since we've seen more snowmobile activity than during the past couple of days. 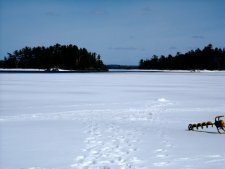 Now that the Trout season is open for inland lakes, some folks are managing to find small, deep water lakes that froze after the first big snowfall. With less snow cover, the slush hasn't been as bad as it's been on the lakes that froze earlier. The best way to travel in is still snowmobile, but if you're looking to live up to your new years resolution and get more exercise, you can hoof it into some of these small lakes too. 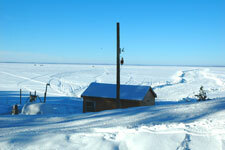 For folks that want to get in on some Walleye and Pike action, there are now plenty of roads plowed on Lake Winnie. Many of them will get you close enough to decent fishing spots. One good way to make the most of using the plowed roads is to use a GPS with one of the popular mapping products. Personally, I like the Lowrance H2O with the Navionics Chip for the best detail. As a drive along the road, I watch the map for structures located within walking distance of the road. Whenever I locate a structure with potential, I walk over to check for old holes. If the spot has already been fished, I keep moving. If there's no sign of past activity, I'll get my gear and drill a few holes. More often than not, you'll find a fishable school of fish this way. 1/1/09 It's been a little tough to get a good head of steam going in the Deer River area this winter because frankly, the crummy weather has kept us from getting really excited about leaving home. Wednesday was a nice sunny day so I went on a tour of the area checking the snow conditions at some of the landings we want to use next week. The story at most of the public access sites isn't changing. Snow has drifted most of the ramps closed and if no one has had a personal interest in plowing them open, there's really no way to get out with a truck or most ATV's. If you have a snowmobile or something with a track drive, you're in the driver's seat right now. My first stop was at Six Mile Lake where I discovered that the is zero access to the lake or even the access roads right now. It looked like some folks may have drive into the North end some time ago, but I would not suggest doing it now unless you're ready to plow it out. 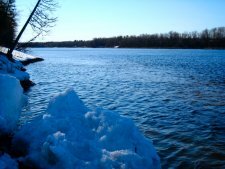 There is good news though, especially on Lake Winnie where some of the resorters are getting caught up with the snow plowing and miles of new roads are being added this week. Highbanks Resort opened a couple of days ago and now has good roads plowed out from the lodge to the main drop off on the east side of Winnibigosh and they are plowing new territory right now. Sunset View on the East side of the lake has a couple of miles plowed out from their lodge into Tamarack Bay. Denny's resort on the South end has some good roads started, but an ice crack flooded part of the road so it's temporarily blocked allowing some time for it to re-freeze. Probably the best setup in terms of coverage right now is out of Nodak Lodge where they have good roads plowed out to most of the main lake bars on the South and Southwest corner of the lake. According to the fishing reports coming in, Perch and Walleye activity is okay but kind of spotty right now. The Walleye bite is your typical early morning/late evening run and the better Perch action occurs out in the deeper water (30 to 32 feet) adjacent to main lake bars. The best fishing action on Winnie this week has been for Northern Pike with a lot of fish being caught on tip-ups set in the 14 to 19 foot range on the main lake bars. If you're heading this way for the weekend, it sounds like a good idea to throw in a couple of tip-ups just in case. For kicks, I came home across County Rd. 35 and checked the North landing at Bowstring and found that even though it's not "plowed", there is a cow path from the landing out to the main drop off on the North side. I stopped in at the Bowstring Store and they told me that the folks at Snug Harbor on the North side of Bowstring have a couple of miles of roads plowed as well. Talking to some anglers who have been up to Red Lake, I got the report that snow cover is lower up there and they were able to do some off road driving once they got away from the shoreline. If you're after Walleye, that might not be a bad plan either. Unless the weather gets bad today (Thursday), we'll be out on the lake so I should have a little more news for the weekend and we'll try to keep up to speed over the next few weeks. Here was the highlight of our trip. Matt Mattson caught this 31inch Laker on a Northland Tackle Airplane Jig tipped with a chunk of cut Herring. Chester Powell with a 19 inch Lake Trout caught on a White 4 inch tube. The folks at Highbanks have their road open and are expanding it daily. 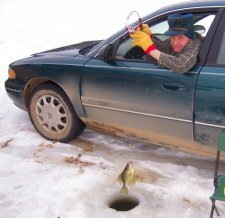 Who says ice fishing has to be a lot of work? here's a picture sent to me by Mike Arlich. His dad Ray still loves to catch 'em at age 88. Good work Ray. 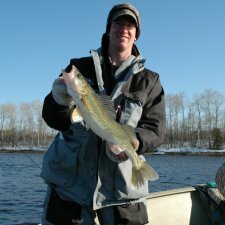 Matt Mattson with a 22 inch Walleye. Not the biggest we've ever caught, but not bad for a cold, slow day fishing the river. On Rainy Lake, deep water ice is good but in the narrows and current areas it's gone. To fish the shallows, we'll have to wait for ice out. At Pelland the river is wide open, but the ramp is still loced up. Turn up the heat! Ice conditions are really good and the weather isn't too bad either. Might as well get out on the ice for one last flurry. After a few days of warm, sunny weather, the snow cover is all but gone. There's still a bit of ice fishing to do but for me, it's time to get the boat ready for river fishing Walleyes. Snowmobiles are still the best way to move around, but the slushy snow is starting to pack down making foot travel a lot easier. My bonus fish on Friday was this nice plump Tulibee. The best Tulibee fishing for the season is usually during the March warm up. 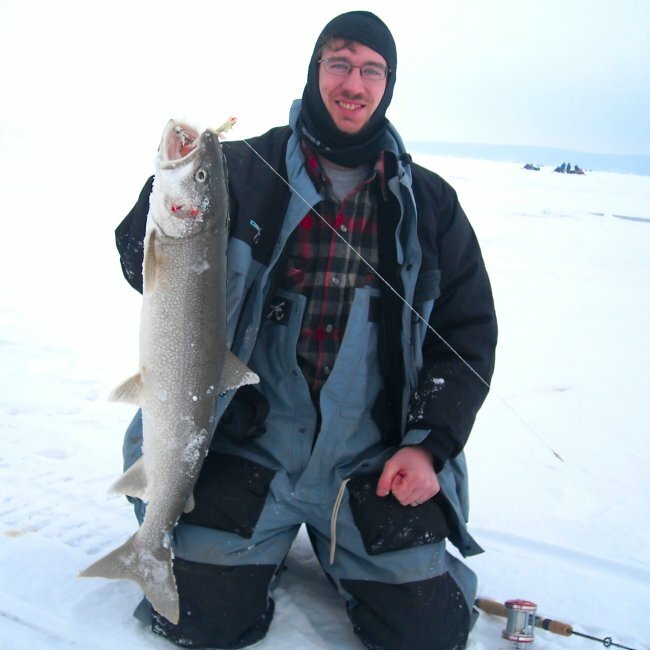 Jan 31, 2009 Pulling a Lake Trout up from 200 feet of water is a job for a stout rod and a heavy reel.